I could hear the echo of the deafening chants reverberating throughout the jam-packed, over-flowing, standing-room-only arena. 10,000 plus avid supporters were decked out in red and white, raucously waving their rally towels and cheering with an unrelenting excitement that made the building shake from the thunderous noise. The lights were bright and the air was crisp. The stakes were never higher with a trip to the Frozen Four on the line. The whole experience initiated in me an overly-excited-but-laserly-focused sensation that resonated from my head, through my stomach, and down into my toes. I was prepared for war. At Cornell, we had heard the boisterous “Let’s Go RED!” chants the entire year. We knew we had the best fans in college hockey. It wasn’t even close. Every game a sell-out. Every game an opposing goalie’s nightmare. Every game a bone-shattering reminder to our opponent that they were not welcome in our house. Our fans understood our tough, relentless, wear-you-down-till-we-knock-you-out mentality. They possessed that same unrelenting identity as well. And with “the Faithful” we developed a kinship, a shared purpose, recognizing the incredible impact we had on one another…and more importantly…on our opponents. But on this day…March 26, 2006 in GREEN BAY, WISCONSIN…with the atmosphere radiating a nervous anticipation that only a potential season-ending tournament game can endure…the “Let’s Go RED!” chants were not directed towards the Big Red. The cheers were for the Wisconsin Badgers. The team that stood in our way of reaching the Frozen Four. The team that stood in the way of a goal we set exactly a year ago in a tear-soaked, silent locker room – after we lost to the University of Minnesota…in Minnesota…in overtime…in this exact same round of the NCAA Tournament to earn a spot in the Frozen Four. WE WOULD BRING THE NATIONAL CHAMPIONSHIP HOME TO ITHACA NEXT YEAR. Nothing would stand in our way of attaining that goal. We would not be denied. Sacrifices would be made. Limits would be pushed. And we were all in. The stage had been set for a BATTLE FOR THE AGES that would be talked about for years to come. But before we get to the game, let me tell you a little bit about our team at Cornell. We were the closest group of guys I had ever been a part of. We were a brotherhood built on a commitment to being the best. We did everything as a team and I honestly loved every single guy in our room. We had zero ego and had more character, heart, and resilience than you could ever imagine. We were a team with a future NHL 30 goal-scorer that back-checked as hard as he tried to score goals. A team with a Hobey Baker goaltender battling dyslexia who used his celebrity status in town to support other kids with disabilities. A team with a set of twin brothers that became All-Stars in Sweden for their offensive prowess, but played critical defensive roles for us and sacrificed their offensive numbers for the the betterment of the team (which probably cost them big contracts in North America). We were a team that had farm boys from Saskatchewan and Alberta, city boys from Toronto and Chicago, mountain boys from Western Canada and local boys from Ithaca. But most importantly, we were a team that had each other’s backs and would do anything for one another. We loved each other and we loved Cornell. This was a team of destiny. And as the puck dropped to start that fateful game, we whole-heartedly believed that we were going to win. We were big, tough, and relentlessly blue collar in personality. We were methodical, disciplined, and infuriatingly difficult to play against. We were littered with future NHL talent (9 NHL draft picks). Both teams were known to lay it all on the line…physically dominant, overly competitive, and renowned for grinding opponents into submission. This game would be a battle of attrition… Two equals trading blows until the final buzzer rang. AND WHAT A GAME IT TURNED OUT TO BE. From the drop of the puck, neither team gave the other space to breathe. Every single inch of ice had to be earned through sheer determination and will. The combination of speed, physicality, tenacity, and skill electrified the sea of red that anxiously awaited the floodgates to open. But neither team would back down for a second. I remember bodies flying after bone-crushing hits. I remember unrelenting battles for 50/50 pucks. I remember incredible players trading chances and goalies being equal to the task. And I remember the feeling of pure and unadulterated joy, knowing that this was the way hockey was made to be played. The battle waged on, and the first period eventually turned to two, and the second period turned to three. Both teams were executing at an incredible level, but every time a team broke through, the goalies were there to stymie the attack. Until that referee blew his whistle with under 2:00 left in the game. At 0-0. In our game of destiny. To get us to the Frozen Four. To call a penalty on…ME. And let me tell you, that was the longest two minutes of my life. The penalty box engulfed me…overwhelming me to the point where I couldn’t breathe. I had to sit there, all alone, and watch Joe Pavelski and his Power Play unit of four other future NHLers get chance, after chance, after chance, to score the game-winning goal and end our storied season. Literally, chance…after chance…after chance. It was a shooting barrage that seemed to never end. If they scored on that power play, I honestly don’t know what I would have done. I know I would have blamed myself for the loss, and because of how much I loved my teammates I don’t know how I would have handled that. Certainly not well. But luckily, Dave McKee bailed me out with his heroic play…just like great teammates always do. And I gave him the biggest hug ever during the overtime intermission. As we sat there in the dressing room, we looked each other in the eye and we just knew. There was no way we were losing this game. We had worked too hard. We cared too much. We had made a promise to each other a year ago in Minnesota, and knew that this win was our destiny. We came out for the first overtime firing on all cylinders. We pressed, pressured and forced Wisconsin with everything we had. We hit a cross-bar off a faceoff. We peppered Brian Elliott with chance after chance. And every time we did, Wisconsin came back and had chances of their own…only to be stonewalled by McKee. It was pure hockey at its finest. And then all of the sudden one overtime turned to two, and two turned to three. In the locker room between the second and third overtime, as we hydrated and tried to find any ounce of energy we could…we continued to look each other in the eye with undisputable confidence and certainty. We were going to win this game. We would not be denied. And we came out swinging for the third overtime like Rocky Balboa in the final rounds of an epic bout. Both teams traded blow for blow, enthusiasm unwavering as the two storied programs dug deep for everything they had. Players crawled to the bench with cramps paralyzing their legs. Teammates held each other up when their brothers were too fatigued to stand on their own. Both teams kept fighting for every inch the opponent would give them, unrelenting in their pursuit for that game-changing play that would go down in history. You know those memories that are so vivid that you remember the sights, sounds, and feelings so incredibly clearly that they become imprinted in your mind forever? This was one of those moments for me. A Wisconsin player turned the puck over in the neutral zone, and my linemate raced with the puck on his right side into their zone. We had a three-on-two and my other linemate, Barsy, unselfishly crashed the net leaving a large array of open ice for me following up the play. I screamed for the puck, and Mikey Kennedy fed me with a perfect pass. I looked up and saw an open net facing me no more than twenty feet away. My eyes widened, I tightened the grip on my stick, and I let go the perfect shot that sailed right to where I had aimed. I was going to be the hero. I was going to send my team to the Frozen Four. And then, out of nowhere, Brian Elliott dove across the crease in a desperate attempt to get his body in front of the puck. He sprawled out with every inch of his being, the puck hitting him on the very top of his shoulder. I gasped as the puck bounced off the top of his pad, into the air, and rolled behind him towards the empty net. I dove head first towards the net, desperately trying to push the puck the final two inches past the goal-line. But Elliott reached back behind him and covered the puck before I could get to it, miraculously saving his team’s season without a split second to spare. The save was the number one play on SportsCenter that night. And I have had vivid dreams about it for the last ten years. Because Wisconsin scored three shifts later. On the bench, I became paralyzed. I could sense the pandemonium happening throughout the arena, but I just couldn’t think or move. I was numb. I don’t know, maybe it was shock. We were supposed to win that game. We made that promise to each other a year ago. I don’t remember much after that, until we got back to the locker room. We sat there…silent. Numb. Confused. Then without prompt or reason, we picked our heads up and looked at each other. And it finally hit us. And the tears started flowing. Not because we lost. Being a part of a college team is so much more than wins and losses. We cried because it was the last time this group would go to battle together. THAT was the realization that hit us the hardest. We loved each other. We sacrificed for one another. We formed bonds that would never be replicated or broken. We laid it all on the line for the name on the front of our jersey and gave everything we had for the program that gave us an opportunity to play college hockey together. I think about that team a lot. When I was recruiting at Cornell, I always found time to meet up with those teammates in the cities I was traveling. Whether it was Saskatoon, Toronto, New York, or Chicago…we would always have a beer and reminisce about this greatest game we ever played in. We would talk about the game for a bit, but the conversation would always turn to the brotherhood we built during our time at Cornell. How everyone on that team was bought in to playing unselfish, Cornell Hockey. How there wasn’t one guy on that team that we wouldn’t take a bullet for. How we worked hard and partied hard as a team, forming friendships that will continue to last a lifetime. That was a special group of guys. Yeah, we were talented. But we got as far as we did because we cared about each other. We didn’t have ego, and our number one priority was the guy next to us, not the guy in the mirror. 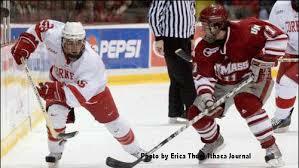 I am honored to have played for Cornell on March 26, 2006. It’s a game that continues to live on in the record books, and is still talked about by fans of college hockey today. But what isn’t shown in the books is the camaraderie and brotherhood formed by this incredible group of guys who became a family. A commitment to each other and the program who gave them a shot to reach their hockey dreams. And even though the outcome didn’t turn out in our favor, we can rest in peace knowing we gave it everything we had for each other. That is what college hockey is all about.